This recipe is like summer meets winter. 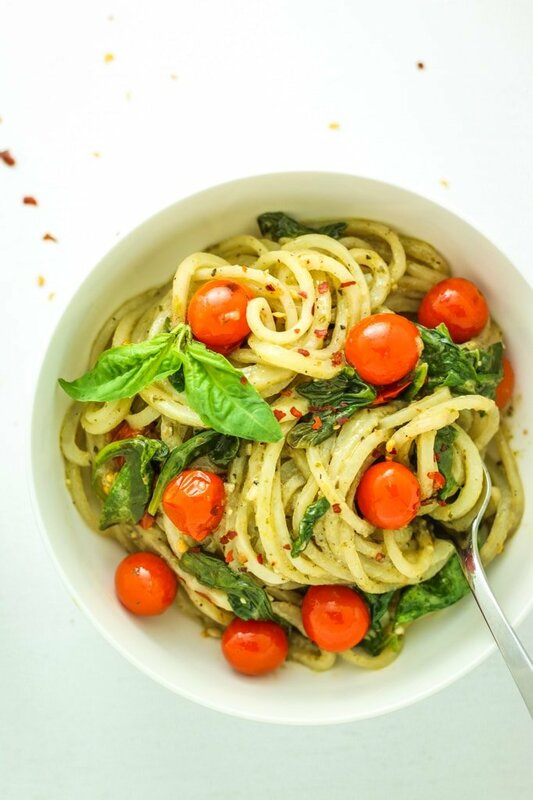 Basil pesto and tomatoes and spinach all mixed in with tender potato noodles. Fresh foods mixed with comfort food = January happiness. This type of recipe is one of the many reasons I love cooking with potatoes. They’re versatile enough to make whatever you dream up and make it taste good! They’re sturdy enough to handle being sautéed without falling apart. They have a mild, neutral flavor that pairs well with the creamy pesto sauce situation. I had a bag of them in my pantry, as usual.  Which means I conveniently did NOT have to go grocery shopping. 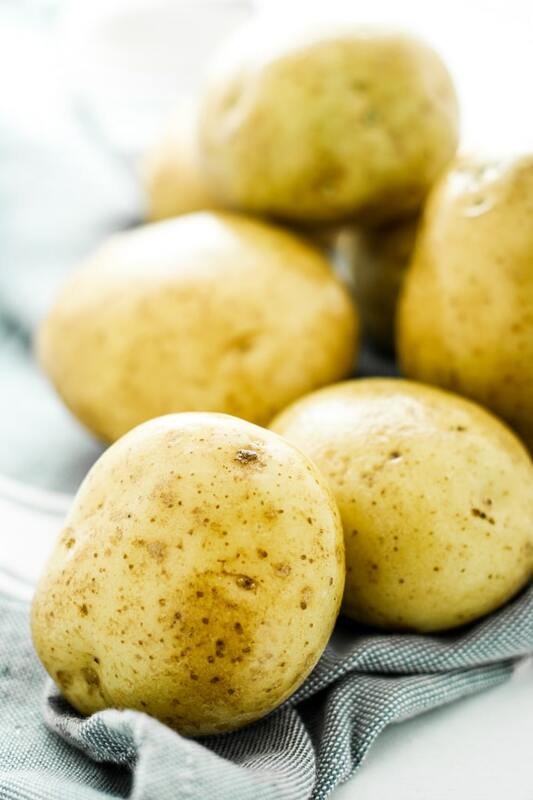 Potatoes USA has an awesome guide with more info on why white potatoes are perfect for this recipe and what to do with other types of potatoes. Trust me – it comes in handy on those nights when you’re standing in the kitchen asking yourself “what can I make with these potatoes and _______?” ALSO – the Potatoes USA Facebook page is a literal gold mine of awesome recipe ideas, so you should definitely be following them. This recipe is incredibly easy. Once the potatoes are spiralized, everything comes together quickly in one pan. 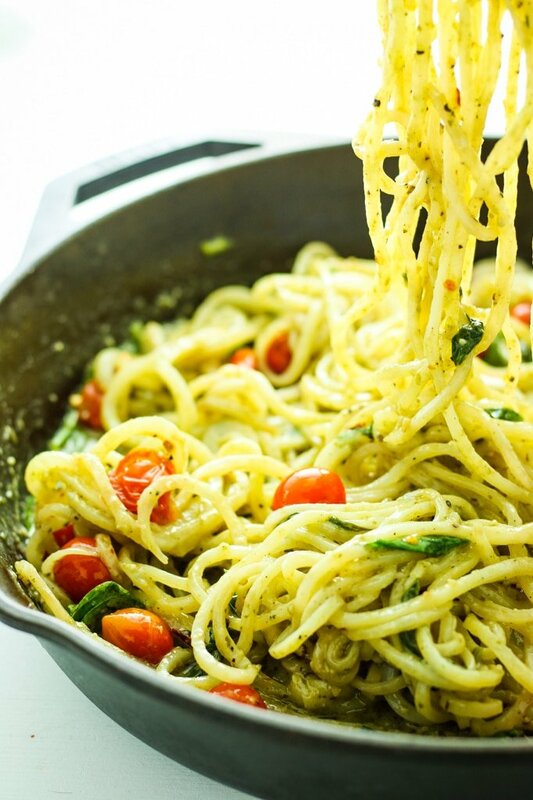 As long as you can refrain from drinking the creamy pesto sauce, dinner should be on the table within 30 minutes. Preheat oven to 400º and line a baking sheet with parchment. Spread tomatoes onto the sheet, drizzle with olive oil, sprinkle with salt. Roast 15-20 minutes, tossing halfway. Remove from oven and set aside. This was SO good!!!! I did add a bit of garlic salt and some Italian seasonings. Seriously delicious! Thank you for an amazing recipe. I’m so glad you enjoyed! 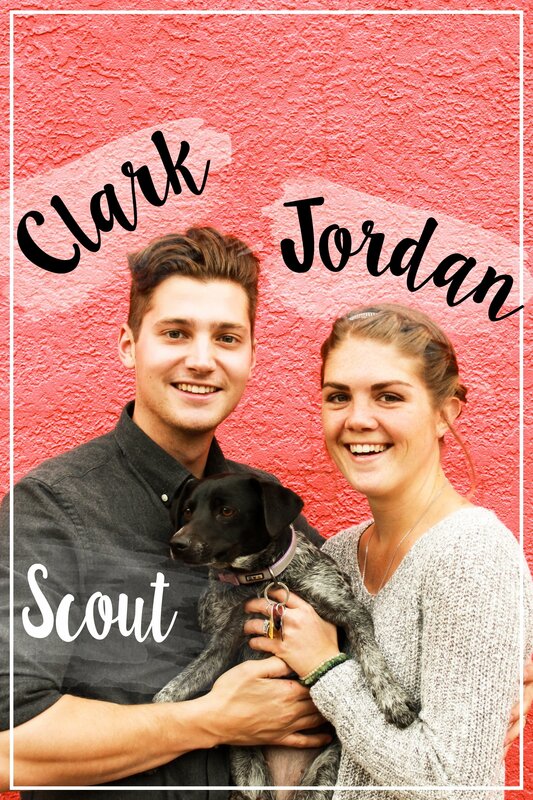 Thanks for the feedback – I always love to hear people’s modifications! Love how quick and easily this dinner comes together! Perfect for busy weeknights! Exactly! Easy to prep and no cleanup! This is a genius idea! I have never tried potato noodles well other then sweet potato ones, I never thought to use any other potato. Adding this to the list! I can’t believe those are potatoes! This dish looks awesome and the flavors sound so comforting. Haha right?! Sneaking a pasta alternative into the mix. Definitely comfort food! I am drooling!! I had never thought of spirliaizng potatoes for pasta- brilliant!! Need to give this a try!! Such a genius idea! potato noodles. Everyone loves spiralizers these days I guess for a good reason. 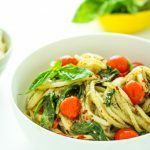 This looks super yummy I love the sauce recipe, I may have to try it with normal noodles before I get myself a spiralizer. Very cool and creative, I’ve had plenty of zoodles, but never potato noodles!!! Gotta give it a try. Great idea! I always think of all the other veggie but forget about how good a spiralized potato would be. Thanks for sharing! It’s such a versatile kitchen tool! 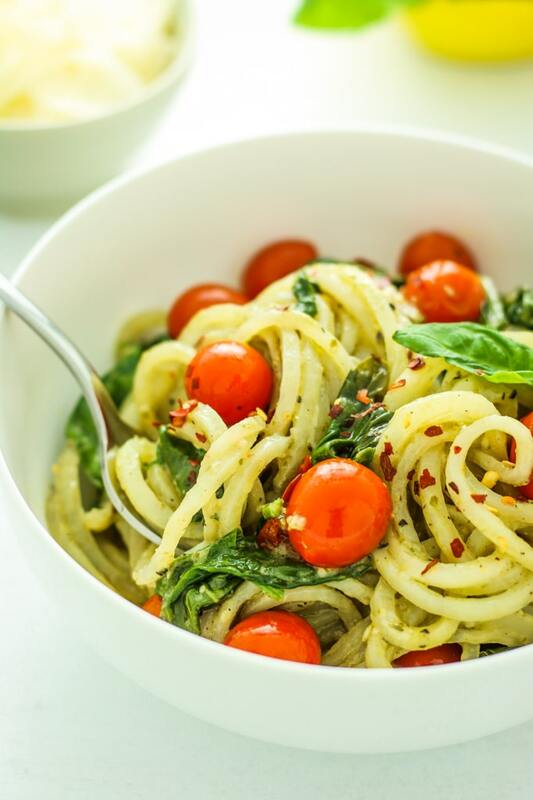 I never thought that potatoes could be spiralized, these potato noodles look scrumptious, love the creamy pesto sauce! Will try your recipe a.s.a.p.! They sure can! And they’re awesome. Enjoy! This sounds amazing! 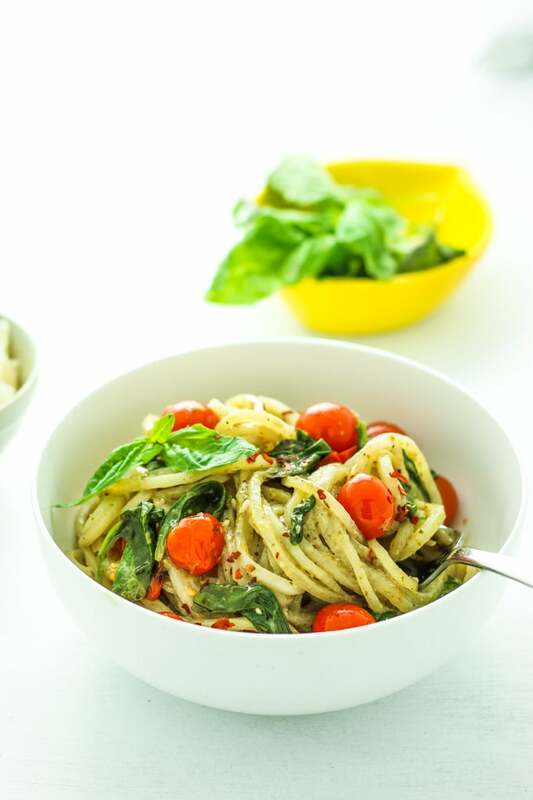 I’ve never heard of spiralized potato noodles before…. and with pesto?! I’m totally making this. I only have a small spiralizer with me right now, so I may need to cut the potatoes in half, but I’m gonna give it a go! Yes! It’s such a good combo. Enjoy!